Teresita E. McCarthy (Manager) B.A. (ed. ), B.A., is a retired educator. She taught for thirty-three years in the classrooms in her native community of Bell Island, NL. She also taught three programs for older workers under a WISE sponsored TIOW program on Bell Island. She is currently manager of the Bell Island Community Museum and #2 Mine Tour. She is a founding member of the Bell Island Heritage Society Inc. and Tourism Bell Island Inc. She has also served as Vice President of the Museum Association of NL (2006-10), President (2010-14) and is currently immediate past President and Treasurer of this association. She has been the Co-Chair of the Bell Island Health and Wellness Advisory Council since 2006. She is the Chair of the Bell Island Ferry Users Committee since 2014. She also serves on the working committee for the Community Sector Council. She is no stranger to volunteerism and has been nominated by the Bell Island Branch of the Newfoundland & Labrador Teachers’ Association for the Special Recognition Award (2007, 2008). In April 2012, she received the Queen's Diamond Jubilee Medal for her contribution to culture and heritage in her community and province. She was elected as councillor to the Town of Wabana municipal council in December of 2014. She and her husband Des have two children Shannon and Gavin and a beautiful granddaughter Tessa. Mr. Ed Fitzgerald was born and raised on Bell Island and after our iron ore mines closed in 1966, he moved to Labrador to work in the mines for 14 years. Ed is a Red Seal Heavy Equipment Mechanic and is a life under writer with Mutual Life of Canada for 3 years. He was an Electronics Tech for 8 years and has been a tour-guide with the Bell Island Community Museum & No. 2 Mine Tour since 2008. Ed is the Father of 2 daughters and lives with his wife Elaine on Bell Island. 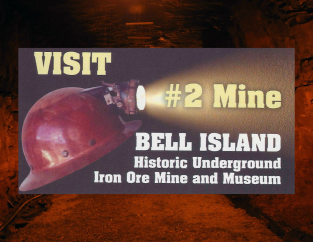 Mrs. Bernie Hammond has been with the Bell Island Community Museum & Number 2 Mine Tour since it first opened in 1998. Bernie was born and raised on Bell Island and grew up on Lighthouse Road where her Dad was Bell Island’s first lighthouse keeper in 1940. Bernie has worked in St. John’s and Ontario for many years and is the Mother of 3. Brian Hickey was born and raised on Bell Island and left in 1990 to attend Memorial University. In 1996 he was hired by Brian Tobin’s Liberal Government as a Government Caucus Researcher. In 2008 Brian was hired by the Department of Municipal and Provincial Affairs as a Policy & Planning Development Officer for the Provincial Waste Management Strategy. In 2010, Brian moved back to Bell Island with his wife Marilee and 3 boys and was hired by the Bell Island Community Museum and No. 2 Mine Tour in 2012. Ms. Samantha Pitts was born and raised on Bell Island and has been with the Bell Island Community Museum & No. 2 Mine Tour since 2009. She was first hired as student from High School and was hired as a Tour Guide in 2015. Samantha is a 5th year student of Memorial University in Math and Physics. Samantha spends her winters living in St. John’s while she attends MUN and moves back to Bell Island every summer to work for the Museum. Mrs. Doris Skanes was born and raised in Lance Cove on Bell Island and is the owner and operator of the Mug Up Shop at the Museum. Doris graduated from St. Boniface on Bell Island in 1963 and did Teacher Training in Moncton NBIT. Doris worked at the Confederation Building in St. John’s and taught at the Vocational School on Bell Island until it closed in 1996. Doris also taught at the College of the North Atlantic until she retired in 1999. Doris is the Mother of 2 and lives on Bell Island with her husband Gord. Mrs. Bonnie Spracklin was born in Carbonear and moved to Bell Island in the 1970’s. She has worked with the Royal Canadian Army Cadets 2410 Bell Island for the past 24 years and been their Commanding Officer for the past 7 years. Bonnie is a member of the St. Michael's Parish Bereavement Team and is also a board member for the Bell Island Community Hospital. Bonnie has been with the Museum since 2008 and recently received her certificate for Basic Museum Studies from MANL (Museum Association of Newfoundland and Labrador). Bonnie is the Mother of 7 and lives on Bell Island with her husband Tom.